TL:DR: Adopting an agile approach to the creation of government digital services requires a rethink of the available infrastructure. NECTAR and APEX are two platforms in the government’s digital toolbox that are changing the way applications are being developed and deployed. GovTech held its inaugural GovTech Stack Developer’s workshop on 25 May 2018 to familiarise developers with the two platforms. In the past, “agile” was used to describe the physical ability of being quick and nimble. Digitalisation has given the word a different flavour—”agile” is now also used to refer to a methodology of software development, typically encompassing the phases of design, build, configure, test and release in a continuous loop. The approach allows for rapid iteration in response to changing requirements, which leads to the gradual refinement or expansion of a software application. Agile software development is ideal for the creation of digital government services, which cater to the constantly-evolving needs of citizens. As Singapore looks to digitalise everything from filing taxes to registering for the Baby Bonus, the infrastructure to support whole-of-government digital applications needed a revamp. This arrived in the form of the Next-Generation Container Architecture (NECTAR) and the Application Programming Interface Exchange (APEX), developed by the Government Digital Services team at the Government Technology Agency of Singapore (GovTech). 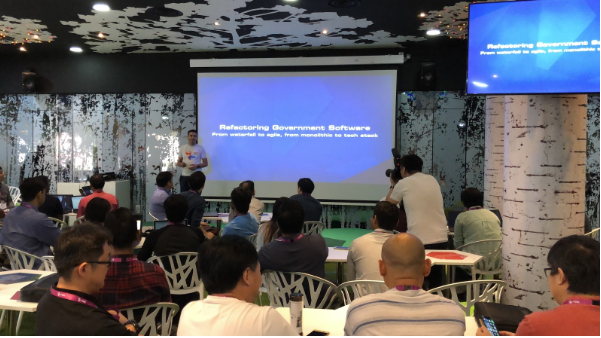 To enable public and private sector software developers to tap on NECTAR and APEX, GovTech organised its inaugural GovTech Stack Developer’s workshop on 25 May 2018. The event was attended by more than 200 professionals. During the workshop, participants were introduced to NECTAR—a cloud-based platform-as-a-service which streamlines and accelerates the process of application development. Built on open-source Docker technology in which application code is packaged into containers that run identically on a developer’s machine or on any other cloud provider that supports Docker, NECTAR reduces the risk of an application malfunctioning due to differences in hardware configuration, or disparities between testing and production environments. NECTAR also removes the need for software developers to procure and maintain their own servers, which are expensive and may be sub-optimally utilised, especially when the resultant application has peak and lull usage cycles. Instead, via NECTAR, developers can scale up or down their operations by varying the number of containers they buy, effectively granting them the freedom to customise their compute power, code and settings according to their needs. In addition to increased compatibility across devices and greater flexibility, NECTAR also comes built-in with security scanning tools, giving developers and consumers peace of mind when building or using applications. Because software rarely functions in isolation, it is also important to pay attention to securing the data exchanged among applications. Application Programming Interfaces (APIs)—coded rules and tools for building software—can be used to manage who has access to data and how data gets transferred. Implemented correctly, APIs allow the seamless transmission of information across multiple parties, whether they be different individuals or organisations. Hence, GovTech has created a centralised government-wide API exchange—APEX—that serves as a searchable library of APIs. Authentication protocols on APEX ensure that only authorised applications have access to highly confidential citizen data. At the same time, activities on the APEX platform are tractable as the system audits and logs the applications that have requested to pull data from government databases. With APEX, data collected and stored by one agency can be used by numerous other approved agencies or businesses to improve and streamline their own processes. For example, MyInfo leverages the capabilities of APEX to enable citizens and residents to manage the use of their personal data for a myriad of online transactions, including applying for a Housing Development Board flat and opening a bank account. The MyInfo API for developers makes it possible for more applications to be integrated with MyInfo without significant hassle or overhead costs. Together, NECTAR and APEX allow the public and private sectors to collaborate effectively and efficiently on digital projects that create value for citizens. Click here for more details and resources from the GovTech Developer’s Workshop 2018.